Record-breaking, but is it ground-breaking too? Despite what Microsoft says, Windows 8 devices aren't flying off the shelves right now, with the tablet market proving to be a particularly tough nut to crack. Enter Acer and its newly-unveiled 8.1-inch Windows 8 microslab. Yes, this is the smallest tablet to squeeze in the full Windows 8 experience, and it doesn't do a bad job of it either considering that it's a fair bit more power-intensive than its direct rivals - the iPad mini and Nexus 7 - and yet just about as portable. But can it excel at the desktop experience? To pack in that full PC experience, the slate comes bundled with an easily-integrated Bluetooth keyboard. All you do is simply slot the tablet into the dock's rubber hold and you're away. No awkwardly missing dock connectors around here. Turn the dock over and the tablet can slot securely into the back, face down, turning the keyboard into a convenient cover when carrying it around. Protection sorted. As for the tablet itself, the smooth metallic back feels nice on the hands, although we're not overly keen on the white border around the front bezel. There's obviously a lot more being packed in the Iconia W3 and the tablet is a fair bit heavier than both the iPad Mini and Nexus 7. It's still usable in one hand, but you'll soon start to notice that extra bulk which feels a little heavier than it perhaps needs to be. The W3's Intel Atom Clover Trail 72760 chip has a dual-core processor with 2GB of RAM and a clock speed of 1.8GHz, meaning the tablet is zippy enough to handle Windows 8 operations. Only a couple of times did we find things slowing down when switching between Office programs, but we can see that the tablet might buckle a tiny bit more had we been able to spend more time on running tasks. 32GB or 64GB storage variants of the Iconia W3 will be available, both of which offer an extra 32GB via microSD. Meanwhile, a micro HDMI output can be found on the bottom of the tablet along with a pair of stereo speakers. The touchscreen display isn't as vivid as you might expect - it only packs a 1,200 x 800 resolution. When jumping around the screen, we noticed that the colours often looked a bit on the dull side. Front and rear cameras are, as expected, present, though at 2MP each they feel like a missed opportunity on a device that's veering into the acceptable-camera-use territory. We found that using the small touchscreen on Office applications, especially Excel, a tad on the fiddly side, but were still impressed by having full-fat Windows in the palm of our hands. And that's another thing - Iconia W3 buyers will also get a copy of Microsoft Office Home and Student 2013 for free as a nice added extra. However - and it is a big however - there are still two questions being begged here. First, do people want the desktop experience in a tablet? Or is throwing the whole thing in missing the point entiely? 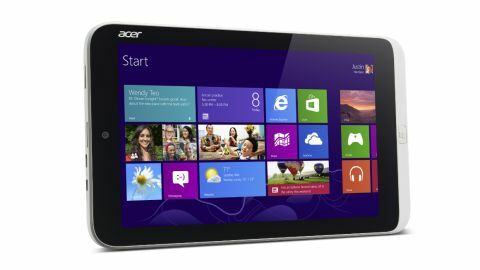 And second, if Microsoft is in fact about to push out a 7-inch Windows 8 tablet of its own, will Acer's matter? We won't really know the answer to the first question until people start picking up (or not picking up) the slate, but having played with the W3, it feels like 8 inches is about a low as you'd want to go when using full Windows. Therefore, Microsoft's offering might actually be one inch cut too many. So what about the price? The 32GB and 64GB will be tagged €329 (about £280, $427, AUS $445) and €379 (about £325, $492, AUS $512) respectively. For that price, we have to say that we expected a little bit more, but we'll hold out on making a judgement call until our full review. The Iconia W3 was always going to impress on being a record-breaker alone, and having played with it, we can see a lot of great benefits in having Windows 8 in the palm. But while this could give the OS the big kick it's been waiting for, it currently feels like the price and ambition should have resulted in something more, though we'd have to spend a lot more time with the tablet to see if it could actually replace both desktop and tablet OS at the same time. Still, at least there isn't long to wait - the Iconia W3 will be launching this month, with pre-orders live now.